Though a common garden vegetable, leek (Allium ampeloprasum) is one of the healthiest vegetables in the world. Leek comes from the same family as onions and garlic and, just like its famous relatives, it too boasts more than impressive health benefits. Research suggests that leek contains special compounds that can efficiently prevent gastric and prostate cancer. In addition to this, it is a great vegetable source of vitamin C, possibly the most potent antioxidant-vitamin known to man. Regular consumption benefits eye and bone health and supports blood coagulation processes. Moreover, leek contributes to cardiovascular health by helping prevent calcium and cholesterol plaques on the inside of artery walls that could restrict normal blood flow and encourage cardiovascular events such as stroke or heart attack. It supports digestion, boosts immunity and helps prevent anemia. Overall, leek is a highly anti-inflammatory vegetable, with a nutritional profile set to prevent chronic disease. What is the difference between leek and scallions or spring onions? As far as looks are concerned, leek can easily be mistaken for spring onions, also known as scallions. They are both white and green, upright vegetables. Nevertheless, a quick sniff can distinguish the subtle fragrance of leek from the iconic onion smell. As funny as it may seem, it is not such a bad idea to guide ourselves after our smell. When purchasing fruits and vegetables, olfaction plays a key role in distinguishing good fruits from spoilt ones and real garden-grown vegetables from no-taste, no-smell, wannabe veggies. Another tell you can look for is appearance: leek is usually taller, larger, bulkier-looking than spring onions, with broader, meaty, crisp dark green tops. Unlike scallions, leek does not have a bulb underground, but preserves a tubular appearance with tightly wrapped white leaves. It also has a milder taste. How to plant leek. Leek is a truly healthy and low-maintenance vegetable you can successfully grow yourself. A well-drained, fertile patch of garden and deep enough trenches (30-40 cm or 12-15 inches) so the plant gets enough protection from the sun will secure you a beautiful leek yield. Depending on the variety, it can be planted either after the last spring frost for a fall yield or in late autumn, before the first frost, to be harvested the following spring. 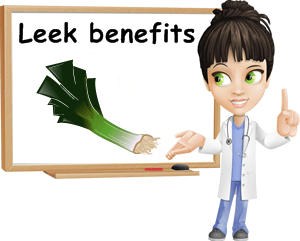 Health benefits and nutrition facts of leek. As humble as they may appear, leeks are actually a great source of vitamins A, B6, B9, C, K and a good source of iron, copper and zinc. More important, they are rich in potent antioxidants which contribute immensely to our good health. About 100 g of leek contains 61 kcal and almost 2 g of dietary fiber, almost no fat and lots of water (83%). This makes ideal if you are struggling to keep you weight and cholesterol levels under control. Fiber is especially healthy because it prevents fat from being absorbed at the intestinal level, reducing blood cholesterol levels and helps relieve constipation and maintain a healthy colon. But the greatest health value of leeks lies in their high antioxidant content. Leek contains three organosulfur compounds: diallyl disulfide, diallyl trisulfide and allyl propyl disulfide. When the vegetable is crushed or chopped, these compounds are converted into allicin by means of special enzymatic reactions. Allicin is a powerful antiviral, antifungal, antibacterial agent, with potent free radical-scavenging properties. The allicin in leek is the same responsible for the antibiotic-like and antihelmintic (anti-parasitic worms) effects of garlic. According to research, the organosulfur antioxidant compounds in leek are the ones responsible for the reduction in stomach and prostate cancer risks. Moreover, preliminary research suggests that allicin may inhibit a specific liver enzyme responsible for cholesterol production, reducing cholesterol levels and blood vessel stiffness. Though further confirmation is sought after, these compounds found naturally in leek, garlic, red garlic and other members of the Allium family appear to reduce blood pressure and prevent the formation of platelet clots. This reduces the overall risks of coronary heart disease, peripheral vascular disease and stroke. Unfortunately, the allicin in leek is highly unstable, thus having an extremely short lifespan and cooking will most likely destroy other beneficial compounds as well, vitamins included. If consumed fresh, leek can help improve immunity due to its incredibly powerful antiviral and antifungal properties which reduce the frequency, duration and severity of common colds and flue. Moreover, more stable allicin extracts are currently under research for their ability to destroy several antibiotic-resistant strains of Staphylococcus aureus as well as the Herpes simplex virus. If you take a look at the nutrition table above, you will notice that leeks are a great source of vitamin C (20%), an incredibly potent antioxidant and anti-inflammatory. Along with vitamin K (39%), they are highly efficient at reducing inflammation, a marker of chronic diseases such as diabetes, heart disease and cancer. Vitamin K is also essential for bone health and supports essential blood coagulation processes. In addition to this, leek contains generous amounts of vitamin A: 55% of the RDA. This means that regular consumption of leek contributes to healthy eyes and mouth, nose, throat, lungs and stomach mucous membranes. Leek is also recommended for treating nausea, dry mouth and loss of appetite. It is also an excellent natural diuretic, great if you are dealing with water retention. However, if you have an irritated stomach mucosa, gastritis, ulcer or a sensitivity to Allium vegetables, you might want to stay away from onions, garlic, even leek. As healthy as it may be, if it upsets your stomach, it might be best if you simply substitute it with some other vegetable. I admit I absolutely love leek, especially since it doesn’t upset my stomach. But while it’s milder than both onions and garlic, it’s not a good idea to eat too much if you have acid reflux or gastritis because it can cause side effects such as stomach upset, severe heartburn or acidity. In limited amounts, leek is healthy and an important source of essential nutrients with beneficial effects. My favorite leek recipe is a simple fresh cow milk cheese, leek and tomato sandwich. But I also find potato and leek cream soup with thyme, pepper and a pinch of salt absolutely delicious and just as healthy. What is your favorite leek recipe?